We keep an eye on high-profile sports injuries. As NYC sports medicine professionals specializing in podiatric care, it’s part of our job. We see a lot of “turf toe” injuries, plantar fasciitis, tendonitis and ankle sprains of all sorts. But we have to admit that we were a little surprised when we came across a toenail injury workman’s comp claim by Tampa Bay Buccaneers kicker Lawrence Tynes. As it turns out, his story is very interesting. It’s estimated that 5% of the general population suffers from ingrown toenails, but this percentage is likely much higher among professional athletes. Tight shoes and toenail trauma are common causes for ingrown toenail development, so it’s no surprise that a lot of NFL kickers succumb to this type of injury. Tampa Bay Buccaneers kicker Lawrence Tynes underwent a procedure on July 30th to fix his ingrown toenail. However, by August 9th, it was revealed that his toe was red, swollen, oozing pus and infected with the deadly bacteria — MRSA! Is MRSA Running Rampant At Buc’s Training Facility? Typically, players would go on the Injured Reserve list when hurt (which means full salary, an accrued season, full benefits and another season toward their pensions), but the team has instead agreed to pay only his $84,000 base salary while he is on the non-football-injury list this season. “The team should not be allowed to do this to players,” Tynes complained after filing an official grievance. The Buccaneers seem to be daring Lawrence Tynes to prove where the MRSA was contracted. 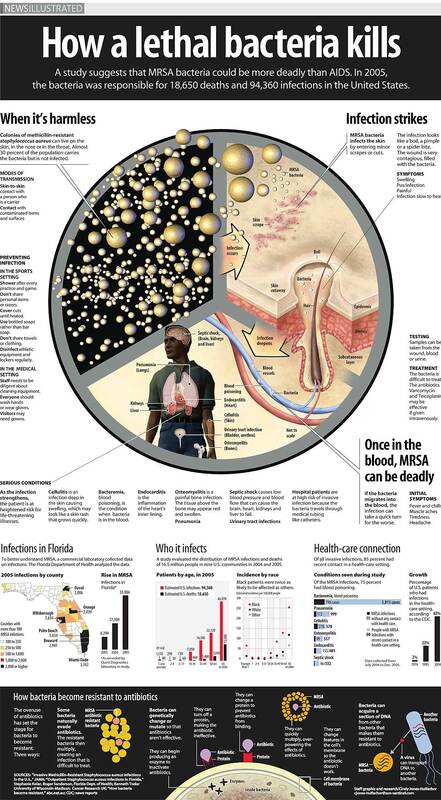 At one time, MRSA seemed to be a danger lurking in locker rooms and hospitals. Now it’s believed that MRSA can lurk in many different places — on towels, benches, equipment and the playing field itself. Back in 2003, the St. Louis Rams experienced a similar outbreak of deadly disease, with 9% of the players coming down with the infection. Soon thereafter, their opponents began coming down with the same non-healing lesions. The CDC was called in to investigate and discovered that MRSA was present in turf burns, whirlpools and on taping gel. In fact, MRSA staph infections have hit the NFL 33 times from 2006 to 2008 — that’s 11 outbreaks a season. The Cleveland Browns, Washington Redskins, San Francisco 49ers, and 27 other teams were among the infected. Unfortunately, it will be difficult to prove that Tynes contracted the infection from the Buccaneers training facility and not somewhere else. Just to be on the safe side, the team had their facility sanitized twice to prevent the infection from spreading to other players. Thankfully, excellent podiatric sports medicine care has kept these talented young athletes alive, despite contracting a life-threatening disease.